Is there ever sushi that is safe for those of us who need to be gluten-free? Sushi restaurants are varied, but they are usually somewhat careful about not having a lot of wheat lying around where the raw fish is being prepared. This doesn't mean everything in a sushi restaurant is safe. Far from it. Avoid all tempura, teriyaki, and anything that might have soy sauce mixed in. Well, not at all. If you choose wisely, there are quite a few sushi rolls that don't normally have any gluten in them. You just can't go and dunk them in gluten-laden soy sauce. This is a sushi boat restaurant just off the beaten path in Palo Alto, CA. It is not in the most glorious or obvious location. But that is all good. Sometimes those are the best kept secrets. I first tried this restaurant almost two years ago during a work trip. It turned out to be a good find. Now I have to share my good luck. They have lots and lots of different sushi rolls on their menu, along with all the other traditional, gluten-laden Japanese offerings. I didn't try any of those, but their sushi rolls are good. Fresh, tasty, and delicious. I did some reading on the internet and this place does not seem to have a very consistent record. I have have not had a problem, but I have only been there at lunch. In fact, this time, we just happened to arrive before they were officially open. I went in and asked if they would open soon, and we were welcomed in, since it was only about ten minutes before their official open time. As I already mentioned, this is a sushi boat restaurant. Right there in the middle of the restaurant is the boat bar, with genuine floating boats. If you know what you want and you are in a hurry, picking up plates off the boats is the best bet. Since we happened to be opening this place, we had time on our hands, so we sat at a table and ordered off the menu. 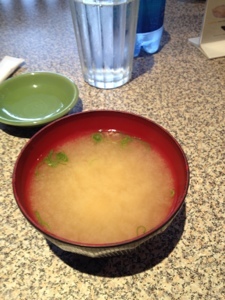 I ordered a side of miso soup and a Philadelphia roll. Our service was a little sporadic. One member of our party ordered a lunch box, which was loaded with a lot of food, and it arrived long before the rest of our food. Finally, the rest of us received our sushi and we dug in. It tasted fresh and good. Later, two at our table wanted to order more. 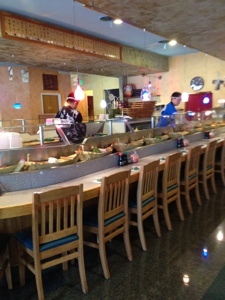 They were discouraged from getting up from the table and taking plates off of the boats over at the sushi bar. Instead, they ordered off the menu again. Finally, we had to ask and we were assured that it was almost ready. It did arrive eventually. Everyone at the table thought the food was good. And the prices are quite reasonable for sushi. 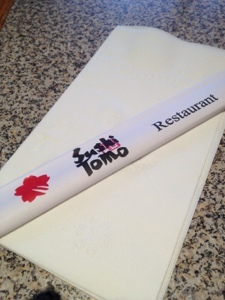 This place has proved to be good and safe for me, if I choose wisely and skip the soy sauce. This is a bit of a bummer, but eating fresh sushi makes up for it. 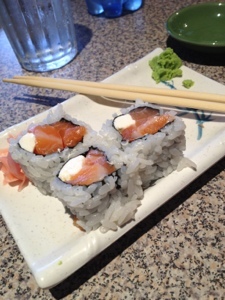 I'm still liking this place for sushi lunch at a reasonable price. My local sushi restaurant has gluten-free soy sauce. It doesn't taste any different! Maybe your place does as well and you just need to ask?